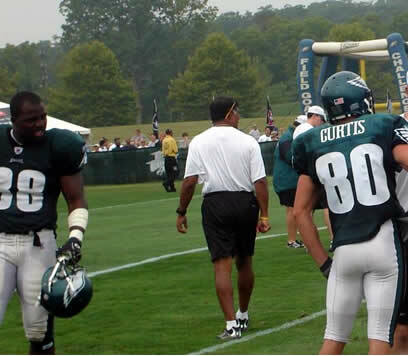  Kevin Curtis is going to be a great fit on this team. He's a great route runner with good speed and he put on quite a clinic Monday morning.  CB Rashad Barksdale was a great find as an undrafted rookie. This guy is a big, physical cornerback who likes to hit. I think he might take Joselio Hanson's spot on the depth chart. 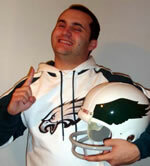  Victor Abiamiri appears to be the most athletic player the Eagles have had on the D-line in a while. 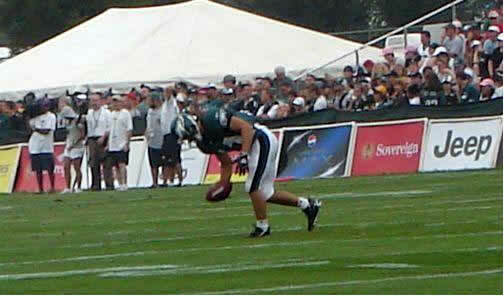 He looks like he has the ability to cover a tight end too, something I felt the team struggled with last season. I wouldn't be surprised if the team trades away one of their six ends in order to get this guy on the field some more.  The linebackers look sharp. 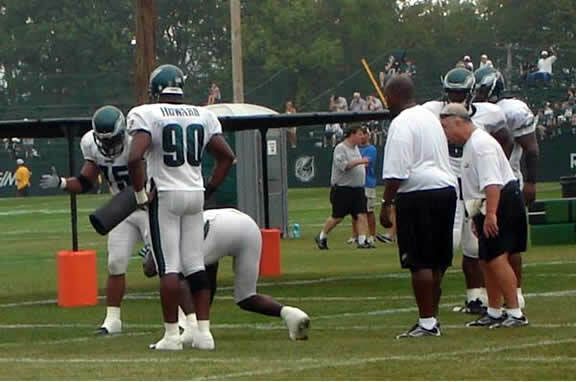 Takeo Spikes looks like the injuries are behind him. Gocong made a big play, forcing Ryan Moats to fumble the football in the backfield. It was exciting to see watch these guys play and I am optimistic the run defense will be much improved.  I got to see three quarterbacks (Holcomb, Feeley, and Kolb) take their share of reps. Not a member of the three looked particularly impressive, although AJ hit Reggie Brown on a beautifully thrown 50 yard bomb for a touchdown. It will be interesting to see how the depth chart turns out behind Donovan. I also took plenty of pictures while I was there. I hope you enjoy. 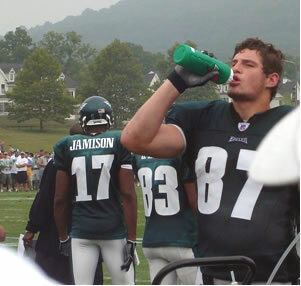 Rookie TE Brent Celek needs a drink after discovering he's been assigned Todd Pinkston's old number. 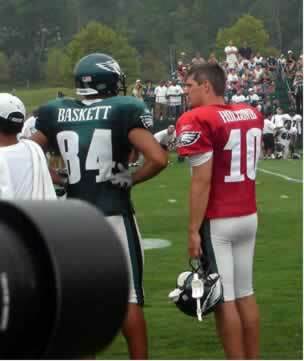 Kelly Holcomb explains to a much younger Hank Baskett the dangers of going gray. 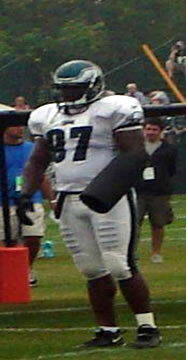 Coach Reid installed this tracking devise on the arm of DT Brodrick Bunkley to prevent him from missing team flights. 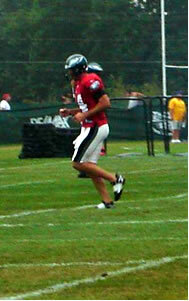 WR Jeremy Bloom has trouble keeping balance without his skis. 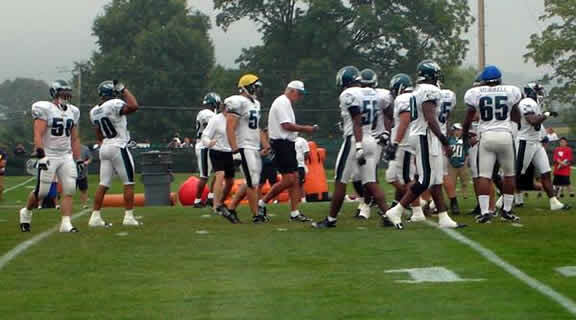 Defensive Coordinator Jim Johnson turns away in disgust as LB Chris Gocong and DE Marques Murrell show up to practice with their underwear over their heads. 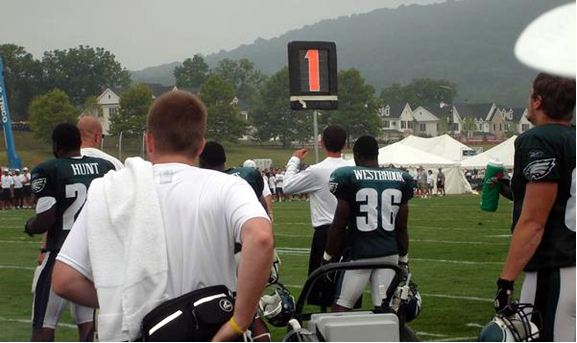 Westbrook rests on the sideline after moving the chains for Kevin Kolb and the offense. DE Juqua Thomas panics after trying on Bunkley's tracking devise and not being able to remove it. 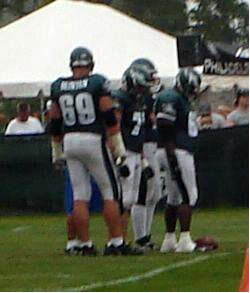 Even after 8 season of duty, the team is still unable to find a uniform large enough to fit OT John Runyan. 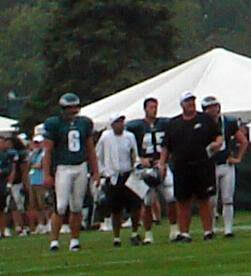 A bored coach Reid inserts himself at Quarterback. Players crowd around to check the posting to see if they won the autograph lottery. QB AJ Feeley leaves practice early to go catch the 10:30 showing of the Simpson's Movie. Coach Reid asks Australian punter Sav Rocca which of the Crocodile Dundee movies was his favorite?